Julian Assange has been found guilty of skipping bail as he appeared in court with his hair in a ponytail after being arrested at the Ecuadorian embassy yesterday. The WikiLeaks founder had spent seven years holed up inside the Knightsbridge building in order to avoid extradition. Yesterday morning Met Police carried him screaming out of the building after Ecuador revoked his asylum. Westminster Magistrates' Court heard the history of the Swedish offences case through the UK courts and how he entered the Ecuadorian embassy when his appeal fail in June 2012 which was in breach of his bail. District Judge Michael Snow found him guilty of failing to surrender on June 29th, 2012. Assange had pleaded not guilty. Judge Snow said Assange's behaviour is that "of a narcissist who cannot get beyond his own selfish interest”. He did not give evidence but his lawyer will argue he had a "reasonable excuse" for not surrendering to custody. Assange faces a jail sentence of up to 12 months when he is sentenced at Crown Court. The judge described Assange's defence as "laughable". He said: "Mr Assange's behaviour is that of a narcissist who cannot get beyond his own selfish interests. "He hasn't come close to establishing 'reasonable excuse'." The court also heard the US has requested Assange's extradition over an allegation that he conspired with intelligence analyst Chelsea Manning to disclose documents. He is accused taking part in "one of the largest compromises of classified information in the history of the United States." 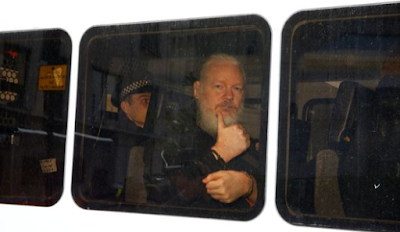 Assange was remanded in custody and will be sentenced at Southwark Crown Court at a date to be set.